Has long, scythe-like, pointed wings (recalling a large swift) and relatively short tail. 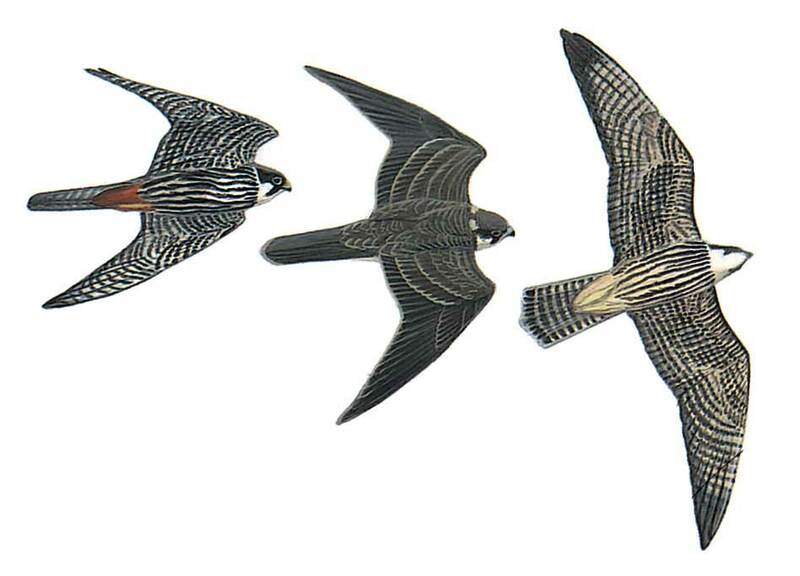 In adult, combination of dark slate-grey upperparts, uniform tail, contrast between prominent moustache and white cheeks/throat, densely streaked underparts with red thighs and undertail-coverts, and shape and length of wings and tail separate it from Merlin and Kestrel. Juvenile browner above with pale feather fringes and absence of red thighs and undertail-coverts. Flight swift and agile; has strong steady wing-beats, short fast glides; accelerates when hunting birds but more relaxed when catching insects.